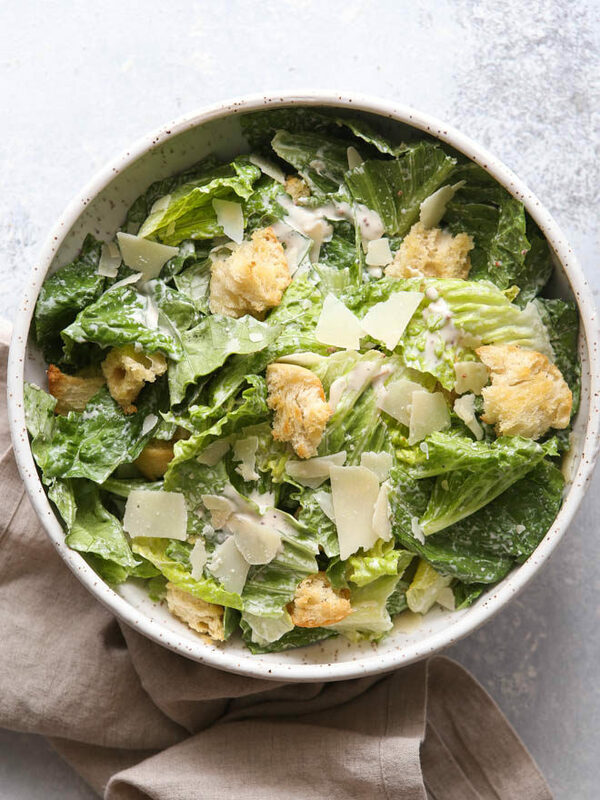 This really is the best homemade Caesar salad! With romaine lettuce, Parmesan cheese, homemade croutons and a creamy homemade dressing. Over the last several months I’ve become obsessed with making Caesar salads. Like, really obsessed. We’re having them with dinner several nights a week and I’m ordering them whenever we eat out. Romaine lettuce and fresh Parmesan cheese are always stocked in the fridge, and I have the dressing ratios memorized. We’re having Caesar salads on pizza night and clean-out-the-fridge leftover night and almost every night in between. It finally occurred to me that I should probably share this salad with you, so that you wouldn’t have to fall down the rabbit hole of googling “best Caesar salad” yourself. 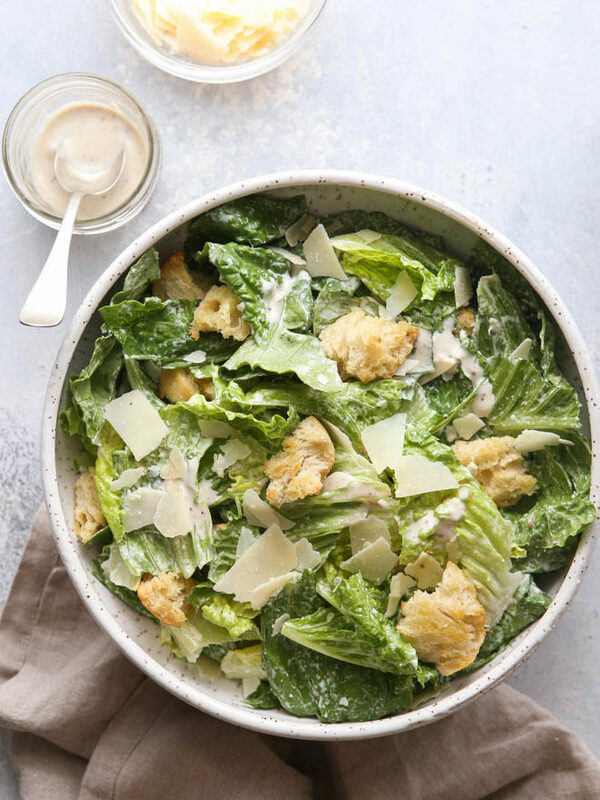 I’ve looked at many recipes, I’ve tried several variations, and this right here is what I’ve landed on— my very favorite, and dare I say best?, Caesar salad. What makes up a Caesar Salad? Romaine lettuce. You can tear it or cut it, though uniform pieces make for easier eating. Croutons. Homemade is preferred! And not that difficult, I’ll tell you how to do it. Parmesan cheese. You can use grated, shredded or shaved. Caesar dressing. Once again, homemade is so much better than bottled. Make a large batch and have it on hand for salads throughout the week. 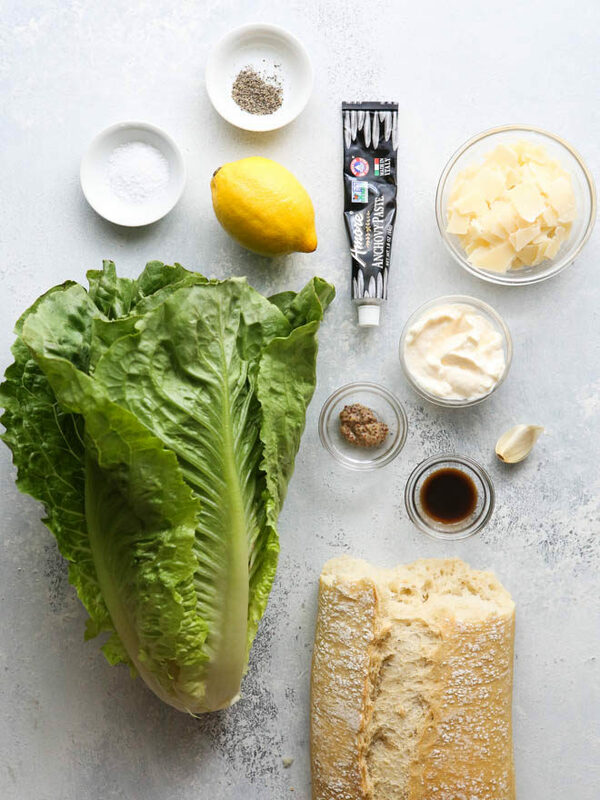 To make Caesar salad dressing I use mayo, lemon juice, fresh minced garlic, Dijon mustard, Worcestershire sauce, anchovy paste , and salt and pepper. I use mayo in place of emulsifying raw eggs and olive oil, as the traditional recipe instructs. This version comes together effortlessly in just a matter of seconds, plus you don’t have to worry about using raw eggs. If using anchovies makes you nervous, it shouldn’t! Anchovies give the dressing its distinct flavor, and using paste from a tube eliminates any unpleasantness. Look for it in a well-stocked grocery store along with the artisan pasta sauces and garnishes, or along with the canned meat. If you can’t find paste, you can also finely chop canned anchovy filets. 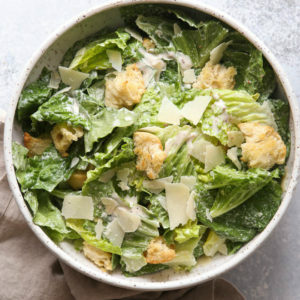 This really is the best homemade Caesar salad! With homemade croutons and a creamy homemade dressing. Drizzle bread cubes with enough olive oil so they are all very lightly coated. Toss and add salt. Spread out onto a sheet pan and bake until edges turn brown, 7-10 minutes. Keep a close eye on them so they don't burn, stir and toss them as needed. Set aside while you prepare the rest of the salad. Can be made several days in advance and stored in an airtight container. Store in the fridge until ready to use. Can be made at least 1 week in advance. In a large bowl, toss the lettuce with enough dressing to lightly coat the leaves (or to your preference). You may not need all of the dressing. Add half of the croutons and Parmesan cheese and toss again. Top with remaining croutons and cheese and serve immediately.